Work on completing these priorities. Sounds simple, but can get tricky without the appropriate structure. Fortunately, there are 2 tools to help you achieve that. 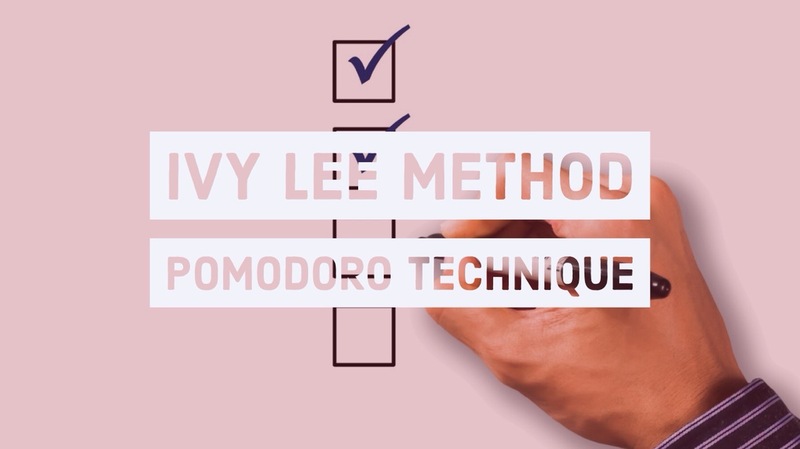 First, the Ivy Lee Method can help you list your most important actions. And second, the Pomodoro Technique will help you focus on taking action. In this article, we’ll discuss each tool so you’ll know how to use each to have a productive day. Ivy Lee is the man who is credited with inventing this simple but powerful productivity method. A quick background about Ivy Lee, so you understand that his method is credible. Ivy Lee established the third PR firm in the United States and he was the first to convince large corporations to create PR departments within their firms. He issued the first press release in history and was a long-time publicity expert for the Rockefeller family. Plus, he made the American Red Cross the most popular charity during the First World War. Enough reasons to remember him as the founder of modern public relations. Nowadays, Ivy Lee is best-known as the creator of the best prioritization method. At the beginning of the 20th century, Charles M. Schwab was one of the richest men alive. He was the head of Bethlehem Steel Corporation, the second largest steel maker in the United States. However, he always strived to be better and more successful. So, he asked Ivy Lee for a productivity advice. Lee asked for no more than 15 minutes with each of his executives. And he didn’t ask for any money. He said that he would accept a check only if the method worked. Three months later, Schwab called Lee into his office. There, on his desk, lay a check for $25,000. And in case you wondered the amount of Lee’s check in today’s money – just add a 0 and multiply by 2. There you have it: the list of your 6 most important tasks for tomorrow. The “Ivy Lee” list. When you start working the next day, start immediately from 1. And don’t do anything else until you complete it. Once that happens, move on to number 2, and so on. Complete as much of your list as you can. So for example, if you get 4 done today, then tomorrow’s priority is yesterday’s number 5. You will add just 4 new tasks that evening. If Ivy Lee received $500,000 (in today’s value) to teach this simple technique, wouldn’t it help you? Ivy Lee’s method concerns prioritization. The Pomodoro technique, on the other hand, is all about tackling procrastination and boosting productivity. To use this technique, you will need a simple timer. It’s better if its a stand-alone timer (not a phone app, cause it will get you distracted). A standard kitchen timer usually works best. Select a task from your list. Start working on the task. It’s only 25-minute, so it’s short enough to focus completely. So, don’t distract yourself and don’t pause the timer. Take a 5 minute break. Step away from your work and do something unrelated during the break. After the break, go back to step 2 and repeat. Every 4 “Pomodoros” you can take a longer break of 30-40 minutes. Keep in mind that this might take some time to get used to. You’ll need to build a habit of working this way. So, commit to doing this for the next 2-3 weeks. Then judge the results and leave a comment below. One of the simplest and most transformational tools available to mindful entrepreneurs. One page. 2 minutes a day. 30 days of growth. Download your PDF copy now. It’s free.